This breathtaking 7000 sq ft. totally private luxury resort nestled among horse ranches is just 40 minutes North of San Diego and perfect for a family getaway, reunion, or corporate retreat. You won't want to leave this serene gated 5-acre property once you experience it. 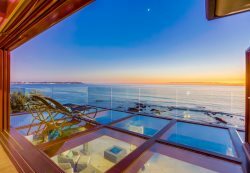 With stunning 180 degree views from every room you'll enjoy spectacular sunrises & sunsets and panoramic views of the ocean and mountains. With vaulted ceilings, the Native American medicine wheel in the courtyard, library, gourmet kitchen and master suite overlooking the infinity pool and waterfalls, you’ll feel as if this is your own private resort. This home is an entertainers dream with: fully-equipped gourmet kitchen, disappearing doors that open to an indoor/outdoor entertainment lanai with BBQ, fireplace, and fire pit overlooking the pool, 60,000 gallon saline water park pool with beach entry, waterfalls, a grotto, swim-up Bar, 12-15 person Jacuzzi, river, 40' Luge slide, and an infinity edge overlooking incredible mountain and ocean views. Enjoy a drink at the swim up bar or fire pit while hot air balloons drift over the clear, clean sky at sunset. A peaceful library with hundreds of books, a meditation garden, and fully equipped gym with wet and dry sauna, are just the beginning of the amenities. Enjoy the open living space with luxurious, custom Mexican furnishings, radiant heated stone flooring, 3 fireplaces, and whole house music system with satellite radio. The sound-proof, state of the art Blu-ray theater is equipped with leather recliners, seating for 12, a kitchen, dvd/music library, Wifi and PC Internet access. The pocket doors melt into the walls, opening 3 sides of the house to merge the gourmet kitchen and dining room with the outdoor BBQ kitchen and lanai with a fireplace. You cannot tell where the indoors ends and the outdoor begins with point-to-point glass meeting the vaulted continuous roof line. All sleeping accommodations are exquisite. The main master suite is the epitome of romance with: fireplace, sitting area, and private access to the outdoor Jacuzzi, pool and river. The marble master bath with towel warmer, jetted tub, and walk in closet has a stunning indoor/outdoor shower. The master suite level is complete with a fully equipped gym with free weights, elliptical, weight resistance training equipment, flat screen DVD/TV and sound system - all the bells, whistles and barbells you could want to stay in shape plus - a beautiful dry or wet sauna that comfortable seats 10-12. There is a 2nd master suite downstairs on the theater level with 2 additional, luxurious bedrooms with full baths and private entrances. There are 2 more bedrooms that accommodate 8. This resort-style vacation home feels comfortable with just 1-4 couples or families. It also accommodates larger groups or corporate retreats up to 20. Additionally, you'll have access to a full array of premium resources and services to further enhance your experience such as: private chef, full gourmet catering, live music, limo service, massage, yoga and meditation. If you find it possible to leave the property you can enjoy: hiking, mountain biking, horseback riding and off road bikes right from the property. You'll be just minutes from Sea World, San Diego Zoo, Wild Animal Park, LegoLand, the Del Mar Horse Racing Track, Downtown San Diego, PetCo Park, The San Diego Convention Center, Gas Lamp Jazz District, Temecula wine tasting, museums, live theater, Scripps Aquarium, paragliding off ocean cliffs - and an endless list of entertainment and fine dining. Disneyland and Knott's Berry Farm, sky diving and the ferry to Catalina with its new zip line are all about an hour away. Some of the best surfing in the world is just 15 minutes from the house with beautiful beaches for beach combing, kayaking, jet skiing, water skiing, scuba diving, boogie and paddle boarding. You'll also have easy access to: para-sailing, hot air ballooning golf, tennis, lakes, rock climbing, and some of the best shopping in the world. The possibilities are endless. This vacation home comes equipped with: surf boards, boogie boards, mountain bikes, beach chairs, snorkel gear, and coolers to chill your wine and beer for the beach! Staying at this home is an unforgettable, unparalleled experience. A sort of magical tranquility permeates the air. Rest assured that this will be a vacation/event that you'll talk about for the rest of your life. Please note: No pets and no smoking allowed. . Our rental agreement includes a no tolerance policy regarding excessive noise, occupancy and/or parties. Deposit forfeitures and/or evictions are strictly enforced. Please make sure you are comfortable with these policies before renting. Please see “NOTES” section for additional information. Portable air beds for set-up in library and theatre - sleeps up to 2. Linens Provided : Luxurious linens and bath towels and beach towels provided. Video Games : Wii player in the Theater. Flat screen HDTV in the master, gym and kitchen. Video Library : Huge selection of current Blu-Ray DVDs. Video Game Console: Wii in the Theater. Playstation, video games and large screen TV in one bedroom sitting area. Music Library : Hundreds of CDs, IPOD Docking Station, Whole House Music System. Controls in each room. Wireless Internet : Wireless Internet is available throughout the house. Hot Tub: Beautiful stone jetted Jacuzzi overlooking the pool with mountain and ocean views seats 15+ comfortably. Sauna: Dry Swedish Sauna seats 8 comfortably with a wet sauna option. Jetted Tub : Air jetted tub in the Master suite. Lanai / Gazebo : Fully disappearing pocket doors on three sides open the house to roofed indoor/outdoor kitchens and living space with fireplace and sitting areas overseeing the beach entry infinity edge pool with waterfalls, grotto and swim up bar. Ocean View : Incredible sunsets, hot air balloon sightings & ocean view to the West. NOTE: The house is definitely kid friendly, but the pool is HUGE and not gated. Smoking is permitted outside, but NEVER in the house. Winery Summer Jazz Program and Palomar Observatory are just 20 minutes away, Disneyland, Knott's Berry Farm, and sky diving are about an hour away and Sea World, Lego Land, San Diego Zoo, Wild Animal Park, museums, live theater and San Diego sites and events are all within 35 minutes. 20 Minutes to Palomar Airport private charters, helicopters and small commercial jets. Long Beach Ferry to Catalina and their new zip line is a little over an hour away. This home is managed by the owner. Please call for details regarding booking.